Wolf Run Lake Wolf Run Lake is in Noble County. This small lake covers 220 acres of fishing water and has 8.5 miles of shoreline. It lies within Ohio Division of Wildlife District Four(4). 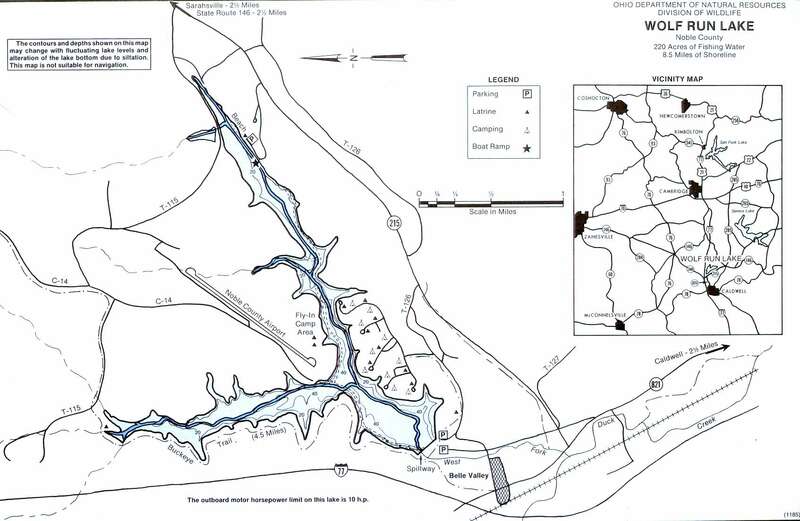 Location Wolf Run Lake is located in western Noble County approximately three miles north of the city of Caldwell. Access from I-77 is at the Belle Valley Interchange with State Route 821. Distance from Major Cities Three(3) miles north of Caldwell. 19 miles south of Cambridge. 103 miles south of Akron. 25 miles north of Marietta. 75 miles east of Columbus. Fishing Opportunities Wolf Run Lake is managed as a Rainbow Trout Fishery. Anglers can also find; *Largemouth Bass *Bluegill *Crappie. *Channel Catfish are stocked by the Ohio Division of Wildlife. Boating Information There is a 10-hp restriction at Wolf Run Lake. An improved launch ramp is located on the southeast side of the lake. Wolf Run State Park is a 1200 acre park surrounding the lake. State Management The Division of Wildlife activities include ~ monitoring fish populations ~ construction of fish attractors ~ physical and chemical water analysis. A very special THANKS to the Ohio Division of Natural Resources, the Division of Wildlife and the Division of Watercraft for their hard work and dedication in providing Ohio sportsmen and women with safety and excellent boating, fishing & hunting opportunities!